BonAqua/BonAqa/Bonaqua/Bonaqa – bottled water, carbonated and noncarbonated, fruit-flavoured or unflavoured. Available in parts of Europe, Asia, Africa, and South America. Renamed "Aquabona" in Spain. Canning's – fruit-flavoured soft drink available in Trinidad & Tobago. Rebadged version of Fanta. Chinotto – lemon-lime-flavored soft drink available in Venezuela. see Sprite. Coca-Cola California Raspberry – Released 2018, a naturally flavored variant of Coca-Cola sweetened with cane sugar. Coca-Cola Georgia Peach – Released 2018, a naturally flavored variant of Coca-Cola sweetened with cane sugar. Coca-Cola Stevia No Sugar – a test product as a replacement for Coca-Cola Life. Launched only in New Zealand in 2018. Coca-Cola Orange Vanilla – Released 2019 - the zero sugar version was also released. Coke II Re-formulated Coca-Cola, replaced original formula Coca-Cola as "New Coke" for a brief time in 1985. Re-branded Coke II in 1992. Discontinued ca. 2002. Dunkin' Donuts – Released 2017, ready-to-drink iced coffee beverages available in Original, French Vanilla, Mocha, Espresso, Cookies & Cream and Pumpkin Spice flavors. Dunkin' Donuts Shot In The Dark – Released 2018, ready-to-drink iced espresso beverages available in Mocha, Vanilla and Caramel flavors. Georgia – coffee drink available in Bahrain, India, Japan, South Korea, Qatar, Oman, Saudi Arabia, and United Arab Emirates It is also available in the United States exclusively through Japanese Supermarkets. Hit – fruit-flavoured carbonated soft drink available in Venezuela See Fanta. Inca Kola – soft drink available in Peru, Bolivia, Ecuador, Chile, and Sweden It's also available in Spain through Latin American food stores. Nestea – flavored tea drink. Available in Aruba, Australia, Austria. Belgium, Bosnia & Herzegovina, Brazil, Bulgaria, Canada, Cayman Islands, Chile, China, Colombia, Costa Rica, Croatia, Cyprus, Czech Republic, Denmark, Ecuador, Equatorial Guinea, Estonia, Finland, France, French Guiana, Germany, Greece, Guadeloupe, Guam, Hong Kong, Hungary, Iceland, India, Israel, Italy, Latvia, Lithuania, Luxembourg, Macau, Macedonia, Malta, Mariana Islands, Martinique, Morocco, Netherlands, New Zealand, Norway, Panama, Philippines, Poland, Portugal, Republic of Korea, Reunion, Romania, Russia, Serbia, Saint Kitts and Nevis, Slovakia, South Africa, Spain, Sweden, Taiwan, Thailand, Turkey, Turks & Caicos Islands, U.S. Virgin Islands, Ukraine, the United States, and Vietnam Only ready to drink products are a joint venture between Nestlé and Coca-Cola. Sparkling Yogurt – Carbonated yogurt manufactured by Global Beverage Ent. Inc.
Surge – Citrus soda, discontinued 2003, re-released in 2014 as an Amazon exclusive and later in 2015 in fountains at Burger King restaurants. Retail re-release in 2018 in 16oz cans. Thunder - Fruit-flavored energy drink available in Philippines, replacing Samurai. ^ a b "Brands". Coca-Cola official website. January 7, 2013. ^ "Coca-Cola — Our Brands". Archived from the original on February 6, 2007. Retrieved 2007-02-11. ^ "Coca-Cola Bottling Indonesia – AdeS". Coca-colabottling.co.id. Archived from the original on 2011-04-29. Retrieved 2011-12-01. ^ "7x Reference Collection » Alhambra water". Coke.7xpub.com. Archived from the original on 2011-10-07. Retrieved 2011-12-01. ^ "7x Reference Collection » Ambasa soft drink". Coke.7xpub.com. Archived from the original on 2011-10-07. Retrieved 2011-12-01. ^ a b c d e f g h i j k l m n o p q r s t u v w x y z aa ab ac ad ae af ag ah ai aj ak al am an ao ap aq ar as at au "The Coca-Cola Company, 2003 Summary Annual Report: Brands". .coca-cola.com. Retrieved 2011-12-01. ^ a b c d e f g h i j k l m n o p q r s t u v w x y z aa ab ac ad ae af ag ah ai aj ak al am an ao ap aq ar as at au av aw ax ay az ba bb bc bd be bf bg bh bi bj bk bl bm bn bo bp bq br bs bt bu bv bw bx by bz ca cb cc cd ce cf cg ch ci cj ck cl cm cn co cp cq cr cs ct cu cv "The Coca-Cola Virtual Vender". Virtualvender.coca-cola.com. Archived from the original on 2011-05-17. Retrieved 2011-12-01. ^ a b "CokeUSA". CokeUSA. Archived from the original on 2009-12-25. Retrieved 2011-12-01. ^ a b c d e f g h i j k l m n o p q r s t u v w x y z aa ab ac ad ae af ag ah ai aj ak al am an ao ap aq ar as at au av aw ax ay az ba bb bc bd be bf bg bh bi bj bk bl bm bn bo bp bq br bs bt bu bv bw bx by bz ca cb cc cd ce cf cg ch ci cj ck cl cm cn co cp cq cr cs ct cu cv cw cx cy cz da db dc dd de df dg dh di dj dk dl dm dn do dp dq dr ds dt du dv dw dx dy dz ea eb ec ed ee ef eg eh ei ej ek el em en eo ep eq er es et eu ev ew ex ey ez fa fb fc fd "Coca-Cola – Brands – brand List". Thecoca-colacompany.com. 2010-09-29. Retrieved 2011-12-01. ^ a b Meyer, Zlati. "Craft soda makers add fizz to flat soft drink sales". USA Today. Retrieved 3 June 2017. ^ "7x Reference Collection » China Coca-Cola Brand and Product Names in Chinese". Coke.7xpub.com. Archived from the original on 2011-10-07. Retrieved 2011-12-01. ^ Sargent, Ewan. "New Zealand gets first taste of Coca-Cola's new recipe". Stuff.co.nz. Retrieved 18 October 2018. ^ "Coca-Cola FEMSA Brazil". Femsa.com. 2010-12-31. Archived from the original on 2011-10-01. Retrieved 2011-12-01. ^ a b "CCHBC completes Dorna acquisition". Foodanddrinkeurope.com. Archived from the original on 2007-10-26. Retrieved 2011-12-01. ^ "Can museum". Can museum. 2009-02-22. Retrieved 2011-12-01. ^ "South Africa's favourite Iron Brew". Coca-Cola South Africa. Retrieved 20 May 2013. ^ Parfitt, Tom (2007-02-05). "Kvass is it! Coke taps Soviet brew". The Guardian. Retrieved 2013-04-25. ^ "NEXSTEP BEVERAGES Trademark Information". Trademarkia. ^ "Coca-Cola Product List". Thecoca-colacompany.com. 2010-09-29. Retrieved 2011-12-01. ^ "AMEinfo article on Quwat Jabal". Ameinfo.com. 2007-02-02. Archived from the original on 2012-02-11. Retrieved 2011-12-01. 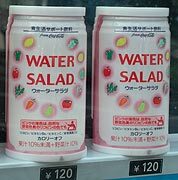 ^ "Image of Water Salad". PhotoMann Travel Photography.